In today's crowded sauce market, so many products are hybrid blends that borrow from the traditions of various BBQ regions. Not so for Rufus Teague. Rufus Teague BBQ products are unapologetically Kansas City. ﻿Though sold nationally, their products are produced in the Missouri BBQ destination and always have been. Rufus Teague sauces are bottled in large glass flasks and slapped with stylish labels featuring a great vintage photo of Rufus. Rufus Teague's packaging is as good as it gets. The flasks are cool on their own, but the labels put them over the top. 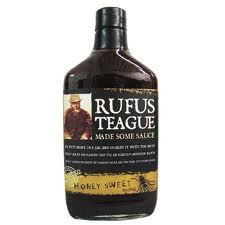 Honey Sweet was the first sauce produced by Rufus Teague. As I mentioned, it's pure Kansas city. The sauce is thick tomato, molasses blend. It's sweetened naturally with sugar and honey. The sauce is all natural and features no HFCS. True to Kansas City form, Honey Sweet balances it's sweetness with natural smoke flavor. Unlike their other sauces, Honey sweet doesn't provide much in the spice department. 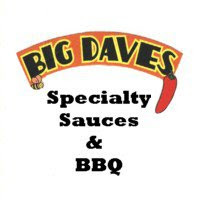 I served Rufus Teague Honey Sweet on babyback ribs to prominent Southern Michigan pig farmer and fellow BBQ lover. He gave the sauce high marks and I had to agree. The thick, dark sauce was a great choice for brushing on the smokey bones. Paired with a salty, somewhat spicy, rub, Honey Sweet was the perfect compliment. The flavors are bold enough to command respect, but mild enough to be enjoyed by everyone. Were I to rank Kansas City style sauces, Rufus Teague's Honey Sweet would be near the front of the line. Though it lacks the spice and layered depth of their great Touch O' Heat, it's still an excellent pork or chicken compliment. It looks great in the bottle and on the meat. Thankfully, it tastes even better. Rufus Teague BBQ products can be purchased on their website. Check out Honey Sweet's star rating on our "Product Reviews" page. 0 Response to "Rufus Teague Honey Sweet"